In our households, Dal is predominantly made with Toor Dal and occasionally Mung Dal. Though Chana dal is used on a regular basis, it is rarely used as dal per se. On an occasion, we were invited to a friend's house who happen to be Punjabis and thats where I first tasted Chane Ki dal with Tomatoes. I instantly fell in love with it. So took the recipe and stored in the forgotten folders of my brain. One fine evening I had a craving for some comforting dal which was out of the ordinary. Thats when I remembered that it has been quite some time that I have not attempted this Dal and so this dal was prepared and relished with full marks being given by the Dad. The kids also seem to have no complaints..So a win-win here!! 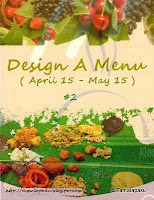 Using this Dal, I designed another menu for 'Design A Menu - 2' event happening here at Tamalapaku. Pressure cook Chana dal with just sufficient water so that the chana dal is cooked al dente. We don't want the dal all mushy. In a sauce pan, add oil and the rest of the seasoning. After the mustard seeds splutter and the urad dal is brown enough, add the finely chopped garlic and saute until they are brown. Add tomatoes and chopped green chillies. After the tomatoes are mushy add turmeric, dhania-jeera powder and mirchi powder. Add the cooked chana dal and mix well. Add salt to taste and garam masala as desired. Remove from fire and serve hot with rice/roti. Sending this Dal to MLLA# 35 brainchild of Susan and hosted by kannada Cuisine. Love this dal ~ The color is so appetizing n I can bet on the awesome taste as well! it look very appetizing!....i am big fan of dal too!...can have it with anything! As you said, for some reason even I don;t use chana dal for dal.. Tomato chana dal is very appetizing! A question regarding the event, can we create 2 sets of menus and post at least one recipe from each menu? Dal looks so tasty and healthy. Wonderful preparation rightly relished by kids and adults alike. Nice recipe and nice click too..